There’s surf, sunshine, scenery, wildlife — adventure. And when you get tired of the tourist scene, there’s Buddha, dharma and sangha. Prepare to be enlightened! The comment comes from a colleague. 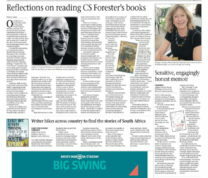 We’re in the newsroom of the Sunday paper we’re both working on in Durban, South Africa. He has just asked where I’m going for my eight-day break and I’ve told him the Buddhist Retreat Center, near Ixopo. He tells me he knows a bit about Buddhists. He once sailed to Sri Lanka on a yacht. He spent a month there and, he says, met lots of Buddhists. He was impressed by their philosophical attitude to what, from the outside, looked like great suffering. The Hindus he met in Sri Lanka, on the other hand — they caused him great suffering. Okay, so they didn’t do it on purpose, he concedes. He wasn’t forced to hotfoot it across a bed of burning coals at a fire-walking ceremony. Nobody held a gun to his head, and the only thing spiritual about the experience was what he poured down his throat beforehand. 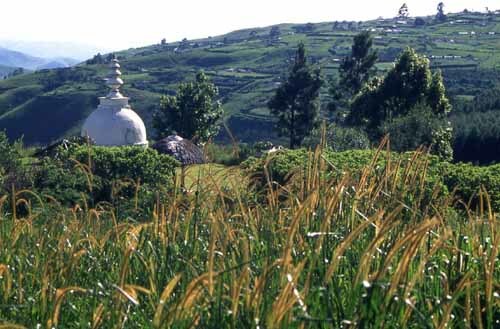 The stupa overlooking the valley. Anyway, he says, he ended up with blistered feet that took weeks to heal and he doesn’t want to try that one again. “But Buddhists don’t do hot coals,” he muses. “They just park off and do nothing.” He phones the Buddhist Retreat Center and makes a booking for himself. 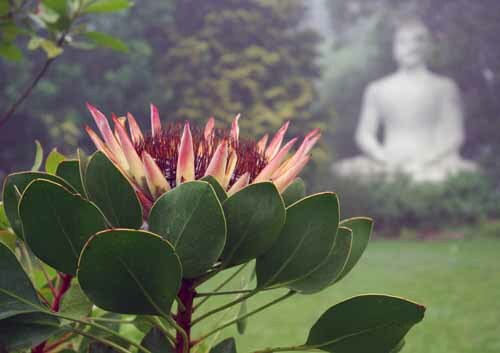 The Buddhist Retreat Center, founded more than 20 years ago by Durban–based civil engineer and regular retreat leader Louis van Loon (who was born in Holland and moved to South Africa in 1956 at age 20), is the unofficial headquarters of Buddhism in South Africa. The center hosts teachers and attracts students from various Buddhist schools — Tibetan, with its elaborate and colorful rituals and visualization; the stark simplicity and rigors of Zen; the more gentle and contemplative practice of Theravada, or insight meditation. It also attracts many non-Buddhists to courses that range from bird watching to sketching to t’ai chi ch’uan. 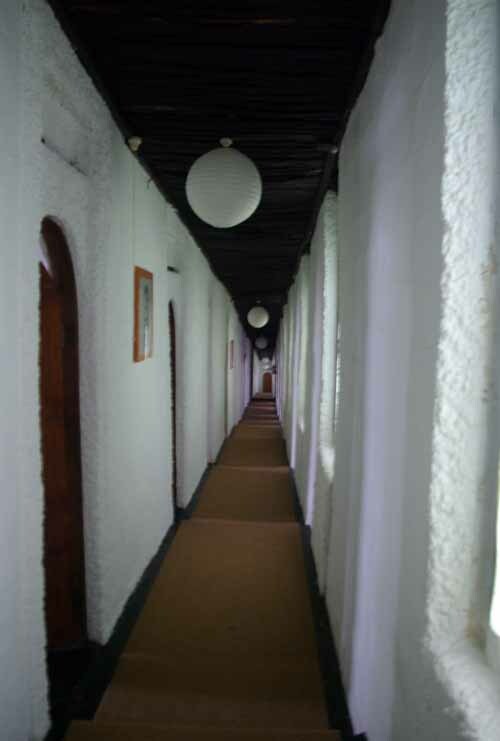 Accommodation is in single and twin-bedded rooms and en-suite cottages. Celibacy is observed. Teachers are not paid for their teaching but rely on ‘dana’ — optional money offerings given by students. The center was awarded National Heritage status by former President Nelson Mandela for its success in reintroducing indigenous vegetation and providing habitats for the endangered blue swallow. 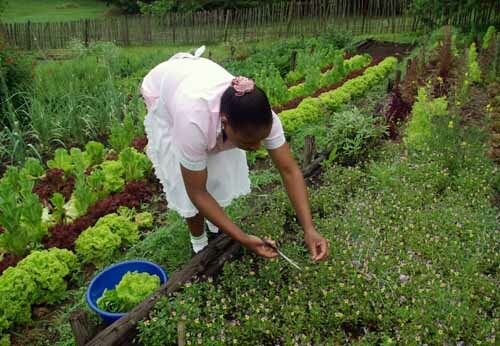 It is also famous for its lacto-ovo vegetarian meals and organic herb and veggie garden. It’s a quiet haven in a remote tribal area — the perfect place, you would think, for a peaceful escape. “We have to ‘sit’ for six hours a day,” my colleague says, with panic rising, when we get there and he sees the schedule, “sitting” being Buddhist-speak for meditation. Which, from the outside, looks as if it is a good way to relax and space out. Until you try it for an hour, six hours, 12 hours — not moving even as you feel the sweat form on your hairline and trickle down your forehead towards your eyeballs on a hot day; not moving as a fly settles to investigate the sweat; not moving as your legs begin to ache for movement from where they are knotted like a koeksister beneath your backside. Not moving — and hell bent on not thinking. Fresh veggies from the garden to the table. Attempting to still the mind by engaging in the simple practice of watching the breath as it inhales and exhales and in the process, learning about it . Playing the “mind to breath” game, which makes me think of fishing with light tackle for a prize game catch — the breath being the hook, and the untrained mind, the fish. You hook it and hold it. Then it runs. Maybe you see it’s going, taking the gap, and firmly but gently (if you’re following the instructions) reel it back. Or try to. After much running and reeling, it seems to be tiring and, for a moment, you think you’ve got it tamed. At this moment, the fish strikes and is gone. I whisper, because for the eight days of the retreat, we’re supposed to stay mute. “Noble silence” is what they call it at Ixopo. The idea is that we keep asking ourselves the question, “What is this?” during the eight daily 45-minute sessions of “sitting” in the zendo, the oblong meditation room with slatted windows that let in the sounds of birds and bees and lawn mowers and, sometimes, African drums from the surrounding valleys and the noise of the chainsaws being used on the property to fell wattle trees as the Buddhist Retreat is a working timber farm. Zen teachers Stephen and Martine Bachelor. We must also ask “What is this?” while doing walking meditation, which takes place between sitting meditation; while eating our meals; and, ideally, while we are asleep. And while we’re asking, our instruction is that we must make sure we’re not looking for an answer. “Don’t confuse a comfortable state of ease for good meditation,” warns Martine Batchelor, a Buddhist teacher from France who spent 10 years training in Korea as a Zen nun. Wattle tree felling at the center. “Meditation is about being focused and bright and questioning. You can’t rest anywhere. You can’t try to resolve the question intellectually. You only know what snow is when you jump into it. That’s like this practice. Just keep asking,” she says. The kitchen team sets out lunch. and Martine, who are married, are doing a teaching stint at the Buddhist Retreat Center in South Africa. Usually they live, write books and articles, and teach at Sharpham College, a Buddhist community in Devon in England. “Perhaps it is the reality that ‘I can be a question for myself’ that distinguishes human beings from other forms of life,” suggests Stephen. While asking “What is this?” he adds, we should rest in a state of not knowing, link this up with an air of expectation — and have no agenda. My colleague whispers that he’s sure only six of us signed up for this 10-day retreat because everyone else read the book beforehand. Randolph Weinberg grew up in Tennessee in the United States, went to a military high school and became a wresting champion. He had a Rhodes scholarship to Oxford University more than 20 years ago and was writing his master’s thesis on the link between mysticism, science and art in the context of Aldous Huxley, when a yearning for inner peace led him to a nearby Buddhist center. 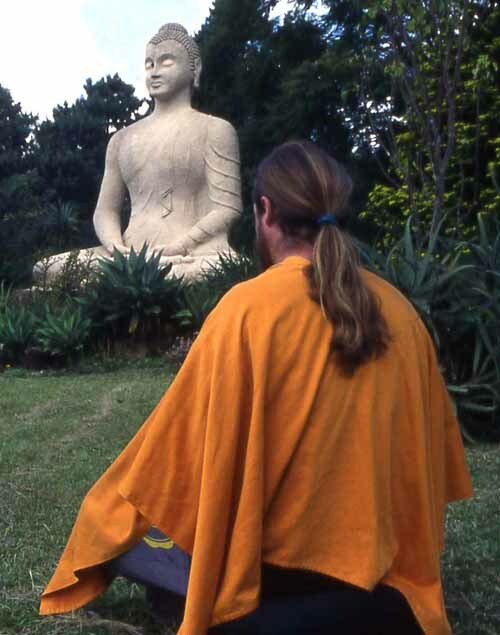 Meditating in the Buddhist Retreat Center garden. To this end he went to Thailand and for two years lived as a Theravada forest monk, which entails staying and meditating in a forest, far from the distractions of city life. When a bout of typhoid nearly killed him and left him debilitated, his Thai teacher suggested he go to England and continue to practice with a forest order that was being set up in Sussex. 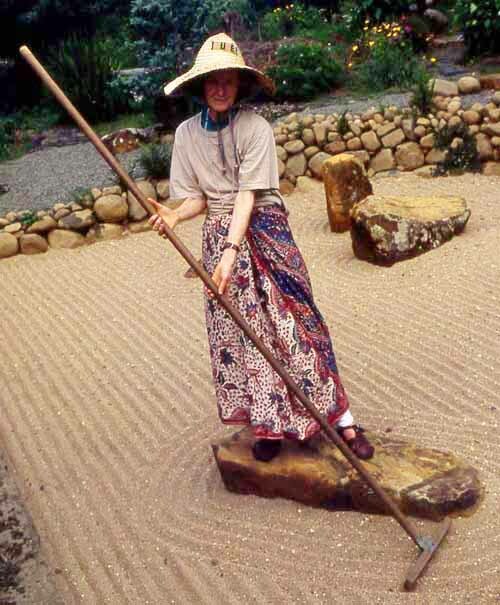 Mary Weinberg was studying at Southampton’s College of Art when “I veered off to follow my interest in meditation.” She first spent seven months at a Buddhist meditation center in India and then visited similar centers in Myanmar (Burma) and Sri Lanka before ending up in Thailand, where she lived for a year at a forest monastery. She returned to England and spent 12 years with the Sussex forest order. 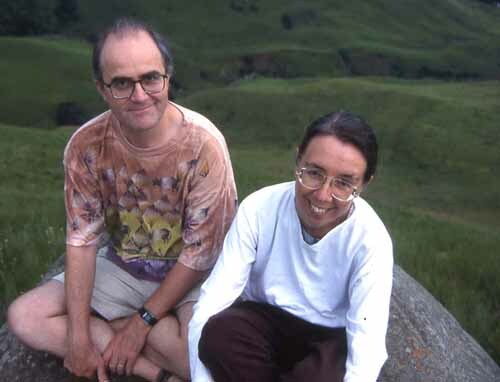 In October 1991 she and Randy moved out of the forest monastery and were married the next year. Since then, they have kept busy responding to teaching invitations from Sweden, Spain, Germany, Britain and the United States, where they are regularly asked to give classes in awareness training to the growing number of teenagers classified as having attention deficit disorder. In 1994 they became the guiding teachers at the Buddhist Retreat, where they teach under their Buddhist names of Kittisaro (that’s him) and Thanissara. 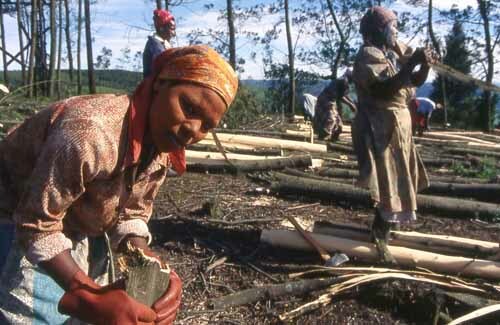 But they came and found kindred spirits in the hills outside Ixopo. They purchased their own small property some distance away, near the town of Underberg in the foothills of the Drakensberg mountains. There, they established a hermitage, Dharmagiri, where they offer residential retreats — and do private retreats of their own. “When one teaches a lot, one can become automatic and divorced from the essence of practice and that’s why we believe it is important that we spend two months of the year alone, meditating and studying the Buddhist scriptures and contemplative writers,” says Thanissara. “Quite a few people who come here aren’t interested in Buddhism but are aware there is an area of stress or fracturedness in their lives and they feel that some sort of calming and meditation will be useful,” says Kittisaro. “More and more, psychotherapy is working with awareness and there is an overlap between Western psychology and Buddhism. The two work together —therapy can help you to have an integrated self while Buddhism helps one transcend the limitations of the self,” says Thanissara. It was Proust who said the real voyage of discovery consists not in seeing new landscapes but in seeing with new eyes. My colleague surprises me, and himself, when he tells me his is now feeling relaxed, spaced out and unwound. So reads the scene-setting opening of Alan Paton’s classic novel, “Cry, the Beloved Country” — a book completed in San Francisco on Christmas Eve in 1946. Read more about Dharmagiri and Kittisaro and Thanissara’s new Khuphuka project. 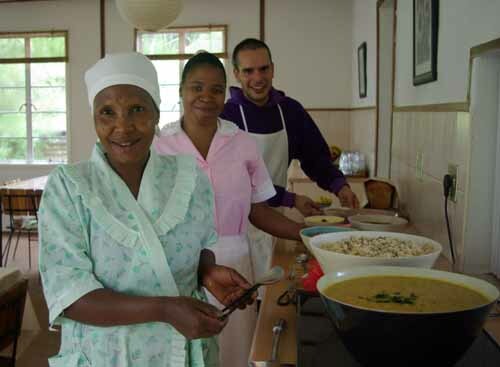 Read about the Buddhist Retreat Center and the Woza Moya project. By all means share this story, but please link it back to this site. Short extracts may be republished with the permission of the author. See contact page for details. This is the most enlightening story on Buddhism I have read. Fascinating. I didn’t know South Africa had spiritual places like that. And I am surprised to note that international teachers visit. Thanks. 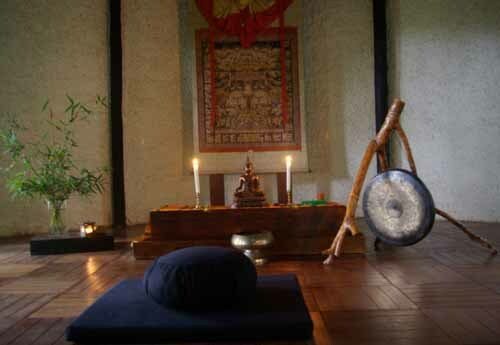 My husband and I have relocated to Umdloti and we are looking for a Meditation group. Do you know of any please. If someone were to ask me if I am a Buddhist, I’d have to say yes. And, with a side note, that once one truly becomes a Buddhist, they realize that they are truly one with everything! To me all religions, all voices and all writings are teachings, expression of the human being working to evolve his/her potential. Buddhism has a way of teaching that transcends and includes all other forms of religion. I was born Jewish. And, it wasn’t until after studying Buddhism that I know have a heart to heart connection with Christ. One of my favorite quotes from Sogyal Rinpoche is: Be a Christian, practice Buddhism! Buddhism teaches a way of understanding mind and its potential separate from dogma or rituals. It’s a very easy step by step way. 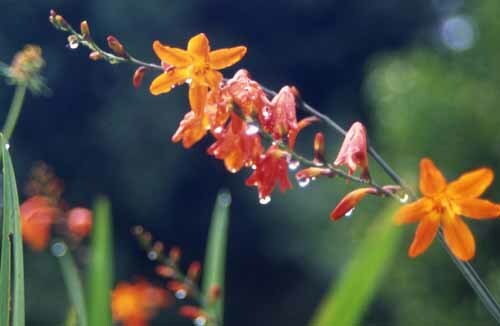 However, the rituals are nice too and help us to see the world from the inside-out, something the English language or any language has difficulty doing.Thank you for the essential education link. I pray that all religions will find a path that can universally flow for all.